Brand-new elementary education alum Kaitlin Koenig took the mic at the College of Education commencement ceremony on May 13, delivering a message of urgency to Redbird Arena. “For me, the whole point of my speech was to get across that this is not a time for us to relax—especially in a world where information travels fast and things develop very quickly,” Koenig said. Koenig certainly walks the talk. She never rested when it came to developing herself and improving at her craft while at Illinois State. The Deaf Redbirds Association and College Mentors for Kids were two student organizations that counted on her leadership. She also volunteered for the partners in reading program at the Normal Public Library and was a member of the Delta Delta Delta sorority. Koenig earned a scholarship through the College of Education that helped her pay for college all four years, and she even nabbed the Superstar Award as an employee of Pizza Hut. 2017 student commencement speaker Kaitlin Koenig. 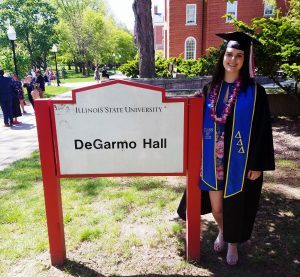 Now an official Redbird education alum, the Barrington native took a deep breath to reflect on her journey and share some advice with freshmen and prospective Illinois State students. When you think back at your time as a Redbird, what sticks out? The camaraderie among students. Everyone wanted to succeed and wanted to push themselves to be the best teacher, and I feel like that held true across majors. Each time I went to study with people, I felt as though I could improve. My classmates wanted me to improve because that’s what they expected of me, and that’s what I expected of them. We each wanted to know as much as we could for our students, so everyone was always willing to hear something new and try something new. We helped each other get closer and closer to our goal of becoming great teachers. Who inspired you the most here at Illinois State? I’ve got two. Professor Tom Lucey and my cooperating teacher, Sandra Faith, who is a third and fourth grade teacher at Fairview Elementary in Hoffman Estates. Sandra completely shaped the kind of teacher that I have become over the past five months. From observing her in January, seeing how she taught, it helped me to understand how I would like to teach. She gave me the resources, the tools, and the confidence to try new things and to challenge not only my students, but myself. Professor Lucey actually nominated me to be a commencement speaker, and he was my social studies methods instructor last semester. He changed the way I thought about teaching social studies. Social studies didn’t excite me; I viewed instruction as reading from a dry, outdated history textbook. But he introduced me to different and unique approaches that focused on what kids can do in the future. So, the types of questions they need to be asking. He really inspired me to create social studies curriculum that could help create socially just students who think critically think about what they should do with the information they receive through so many different mediums. What piece of advice would you give to a freshmen education majors? I’ve got two, again. I would say practice being organized and do not procrastinate. I only say those things because if you practice them your freshman year, you’ll be good to go come your senior year. I know more than one person who still procrastinates and are still unorganized, and they are not succeeding. So if you get into the habit during your freshman year, and if you do it consistently throughout your college career, it will make the world of difference when you’re a senior and student teaching. Those skills transfer to your actual core classes and also assist in you being viewed as professional in general. The second piece of advice is this. Take to heart and pay very close attention to those early major courses. The information you learn in that coursework that will come up during student teaching, particularly on the EdTPA. At times, I really wished I had drilled myself better on the many different teaching theories. The truth is, everything you learn is valuable and you need to know it. Every lesson that a professor teaches is taught for reason. And it’s an important reason. Why should a high school senior who is on the fence commit to coming to Redbird Country? I’ve got two again! First, I’ve never felt more supported and more welcomed. And that goes for not just my classes in the teacher education program, but across Illinois State’s campus. I’ve never felt so welcome to be anywhere, and it started from my first day on campus. Your freshman year, you are given the opportunity to participate in so many different activities. In fact, I felt so welcomed that it was overwhelming. I was very much a homebody who was very nervous to go to college. Before I arrived, I honestly thought I wouldn’t make it a full semester. That obviously didn’t happen. The other thing that made me find love with Illinois State was the way the teaching program prepared me. I felt very prepared going into my senior student teaching semester, and I feel even more prepared after finishing it. Also, I loved that the program is constantly changing to adapt to the curriculum schools are using. We didn’t learn outdated methods or practices. Even though it seems pretty hectic while you’re in it, you’ll realize you’re learning something that has been updated from literally one semester earlier, it’s truly empowering. It’s making you into a teacher who is relevant to what’s happening in today’s classrooms, which is what you want in a program. The preparedness that I feel now is something I have always felt throughout my journey at Illinois State. My story might start out like many others. I wanted to be a teacher from when I was a little kid. Whenever anyone was playing house, I was always playing teacher. I passed out random homework assignments and graded them. I was always failing my brothers and the stuffed animals I didn’t like. What it really was about, though, was that I always loved being the go-to person others could count on. If someone was confused or was having trouble understanding something, or just needed support, I love helping others. So naturally, I chose a service career, and teaching was always my first choice. But someone recently asked me what other career I would have chosen, and it would have been social work or nursing, a profession where I would be able to interact with people and help them to become the best versions of themselves. In my classroom, it’s not just about teaching a lesson, it’s about developing students holistically. That’s another reason I wanted to become a teacher. I wanted to improve the lives of others. Maybe one day, they’ll be inspired to do the same thing, regardless of the profession they choose. I actually started with special education when I got to Illinois State, and I loved it, but I found my ultimate passion with teaching at the elementary level. I taught third and fourth graders this past spring. At that age, they really just want to know more, and they have this thirst for knowledge that really energizes me. I woke up every morning excited to teach, and to push myself and my students to succeed.